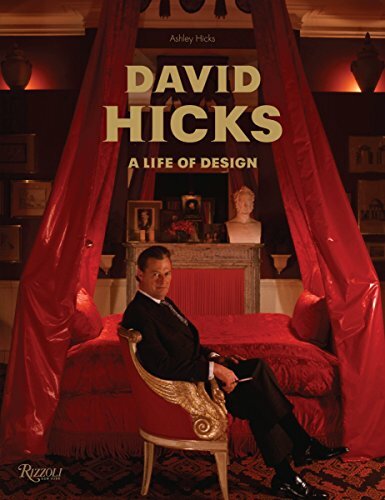 David Hicks is acknowledged as one of the most important interior designers of the late twentieth century, in the company of Albert Hadley and Billy Baldwin. Known for his bold use of color, eclecticism, and geometric designs in carpets and textiles, Hicks turned English decorating on its head in the '50s and '60s. His trademark use of electrifying color combinations, and mixing antiques, modern furniture, and abstract paintings became the "in style" for the chic of the day, including Vidal Sassoon and Helena Rubinstein. By the '70s, David Hicks was a brand; his company was making wallpaper, fabrics, and linens and had outposts in eight countries, including the U.S. where he worked with the young Mark Hampton, and where his wallpaper was used in the White House. "My greatest contribution as an interior designer has been to show people how to use bold color mixtures, how to use patterned carpets, how to light rooms, and how to mix old with new, '' he stated in his 1968 work, David Hicks on Living--with Taste, the last authoritative book on his work. Written by his son Ashley Hicks, who has unprecedented access to Hicks's archives, personal photos, journals, and scrapbooks, this is a vibrantly illustrated celebration of a half century of stunning interiors.